Al-Princess construction & Quarry (ACQ), was contracted to excavate 99,000 m3 of earth to pave the way for the West Side Park project in Qatar. Qatar's ever expanding capital of Doha, is located on the coast of the Persian Gulf and home to an area devoted to research and education known as Education City – the largest educational experiment in the Gulf. A growing number of international schools serve a diverse and rapidly expanding expat community in Qatar, increasing the demand for educational facilities. 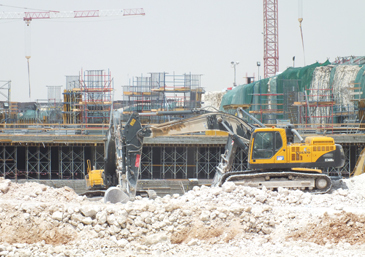 Al-Princess Construction & Quarry CO. (ACQ) was established in 2006 and has grown to become one of the prime excavation and crushing companies in Qatar. The company was subcontracted to excavate 99,000 m3 of hard earth for the West Side Park project when work began in July last year. The West Side Car Park project owned by MAN Enterprise, an international leader in the construction industry, boasts nearly 3,000 car parking spaces. The four-storey superstructure covers about 45,000 m2 and is located inside Education City. The building consists of a basement level, People Mover System (PMS) stations (taking people to and from other destinations within Education City) and a bus concourse. Education City covers 14 km2 and houses educational facilities from primary schools to collages and branch campuses of some of the world's leading universities. Commuters wanting to travel in and around Education City will benefit from the project as the car park creates a link to the People Mover System that takes people to different destinations within the educational area. Working 12 hours a day in a hot desert climate where summer temperatures can reach 49°C, Al Princess needs high quality machinery that's also cost effective. About 35 Volvo Construction Equipment (Volvo CE) machines were used at the West Side Car Park site, including – EC210, EC290, EC240, EC360, EC460 B-Series crawler excavators. The machines support the growing number of contracts won by the company and with its Volvo fleet, Al-Princess is able to accommodate the ever-increasing demand for construction services in the region. The Volvo EC460 crawler excavator has a low-emission, turbocharged, diesel engine with water cooling, direct injection and after-cooler system, especially developed for excavator use. The machine can work at any job site, contributing to good fuel economy, low sound level, less wear and a longer life. The automatic idling system also reduces the engine speed to idle speed when levers and pedals are not being used. The West Side Park project has just completed – earlier this year but the company's fleet of Volvo machines never stop working. They undertake a number of applications for different contracts including excavation, crushing, screening, transportation, grading, backfilling, road works and demolition. Al Princess's central location also puts it in a prime position to take advantage of the city's oil and natural gas industry.